Discussions of conflict of interest (COI) in the university have tended to focus on financial interests in the context of medical research; much less attention has been given to COI in general or to the policies that seek to manage COI. Are university COI policies accessible and understandable? To whom are these policies addressed (faculty, staff, students)? Is COI clearly defined in these policies and are procedures laid out for avoiding or remedying such situations? To begin tackling these important ethical and governance questions, our study examines the COI policies at the Group of Thirteen (G13) leading Canadian research universities. Using automated readability analysis tools and an ethical content analysis, we begin the task of comparing the strengths and weaknesses of these documents, paying particular attention to their clarity, readability, and utility in explaining and managing COI. We thank the valuable research assistance of Elise Smith, Vincent Couture, Ashley Pringle and Aimee Smith who helped with background literature reviews, data collection and summary analyses. This study was supported by grants from the Faculty of Medicine, Univesité de Montréal and the Institute of Genetics of the Canadian Institutes of Health Research. Canadian Association of University Teachers. (2006). CAUT Almanac of Post-Secondary Education 2006 (Ottawa: Canadian Association of University Teachers), retrieved February 28, 2007 from (http://www.caut.ca/en/publications/almanac/default.asp). David, P. A. (2000). A tragedy of the public knowledge ‘commons’? Global science, intellectual property and the digital technology boomerang. Electronic Journal of Intellectual Property Rights WP 04:1–34, (http://www.oiprc.ox.ac.uk/EJWP0400.pdf). Juicy Studio. (2007) Readability test. Retrieved May 5 from (http://juicystudio.com/services/readability.php). Royal Society. (2003). Keeping science open: The effects of intellectual property policy on the conduct of science (London: Royal Society). (http://www.royalsoc.ac.uk/document.asp?tip=0&id=1374). Stevens, B., Stevens, B. (2007). Corporate ethical codes: Effective instruments for influencing behavior. 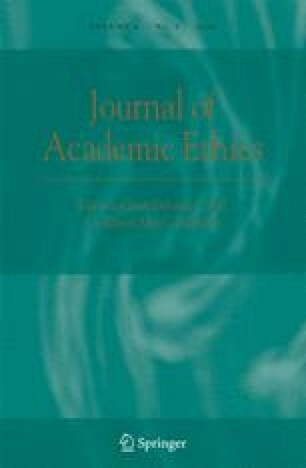 Journal of Business Ethics (in press) DOI 10.1007/s10551-007-9370-z.